Only the highest quality watch batteries are used when we replace your watch batteries. We also use fresh non-expired batteries when installing them in your timepiece. We go through so many watch batteries that you need not worry about expired batteries. At Geneva Watch Repair, we are highly skilled watchmakers that can replace your watch batteries. We are able to install new cells for fashion watches to the most delicate and high-end luxury watches such as Rolex, Cartier, Patek Philippe, Omega, Baume & Mercier, Tag Heuer, Hublot, and more. 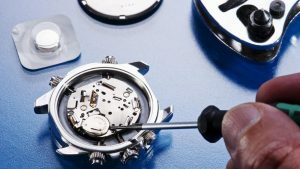 We do not recommend changing out the watch battery by yourself as different models and brands of watches have different designs, methods, and tools that are required for the full installation. Watch batteries replacements should only be carried out by watch professionals due to the risk of damaging the case, caseback, or gasket, and also risk of injury to self. Note that some watches such as Philip Stein, Jacob & Co., electronic and digital watches, and many other watches may require more than one battery install to function properly. It isn’t always just a battery issue. There will be times where the watch may not work properly with just a battery change. This could be due to dried lubrication, dirt within the movement, acid corrosion of battery, damage of the movement, defective movement, or other unknown reasons. In these cases, the watch will need to go to our watch service center for diagnostic evaluation. Our watchmakers will then be able to figure out the problem and an estimate will be given based on the findings. Please rate and review your watch battery replacement experience with us.